Preheat the oven to 350 degrees. Grease a 10 by 13 by 2-1/4 inch baking dish. Bring a large pot of water to a boil. Drizzle some Coratina EVOO into water and cook the noodles until tender. Drain. In a large bowl, whisk together the eggs, half-and-half, brown sugar, vanilla, cinnamon, salt, and pepper. Stir in the ricotta and the fruit of your choice. Add the drained noodles. Pour the noodle mixture into the baking dish. Place the filled dish in a larger pan and pour in enough hot water in the larger dish to come halfway up the sides of the kugel dish. Cover the dishes with a single layer of foil and bake for 45 minutes. Remove the foil and bake for another 45 minutes or until the custard is just set. Top with berries or some other fresh fruit (optional). Serve while still warm. 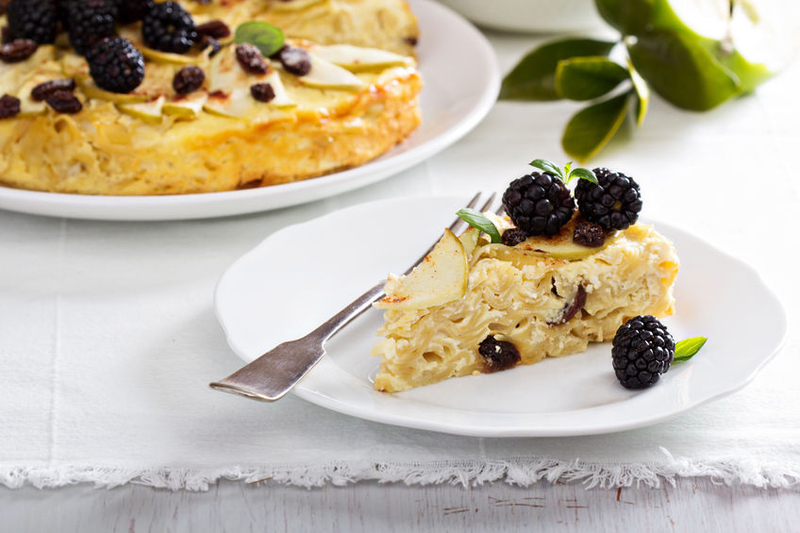 NOTE: A kugel is just a baked casserole with a starch (usually noodles, eggs and fat). It can be savory or sweet. This recipe is sweet and used as a dessert.